Monali Meher is an artist from Mumbai, India. She came to the Netherlands in 2000 for a work period at the Rijksakademie van beeldende kunsten. Since then she has lived in Amsterdam. She was recently invited to participate for two months in the Khoj residency project in New Delhi. Monali talks about what it is like to work in your homeland again after living abroad for a number of years. 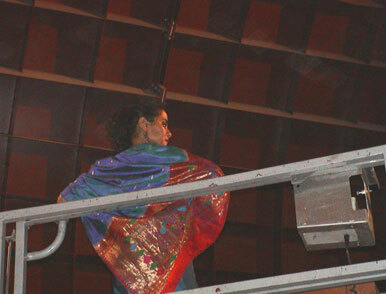 Performance still by Monali Meher, title "Under Preassure", Marta Herford Museum in Germany, year 2004. I was glad with the invitation to come to New Delhi because I believed it was time to once again show my work to the people in my homeland and to hear their reactions. When I started with performance art in 1998, I was heavily criticised by the art world in India. Performance art was not really done here, and there were only a few people who supported my decision to work with this medium. For some time now I have been wondering how people in India will react to my work. What I really wanted to know was whether the thinking process and the reactions have changed over the course of time. In India, they were curious to see whether the move to the Netherlands had changed me and how my split personality, between the two cultures, has influenced my work. When people see my work, they think I am courageous to do performances in which aspects from the two cultures are entwined. But they also say that my performances could be presented anywhere in the world because they are not bound to one culture. The questions and comments that I get here differ from those in the Netherlands. In India, for example, people ask why I wanted to work with this medium. Is it because I like it or because it is Western? The attributes that I use also have a different meaning here. Roses and henna, for example, have a special historical meaning in India, but I also use them for their material properties and to interact with the public. In the Netherlands people are more curious about where I am from. My work does not look very Indian, and they often want to see something Indian in it.